For the last 16 years, parents have been following the guidelines on juice consumption for children issued by the American Academy of Pediatrics (AAP). Well, as of last month, those guidelines have now changed. They now advise parents to reduce fruit juices of all kinds, for children of all ages. They now state that fruit juice offers no nutritional benefit to children under age 1 and should NOT be included in their diet. Until last month, pediatricians recommended fruit juice as a source for Vitamin C and water for infants over 6 months, and sometimes offered juice as a solution to constipation. But even though there are some health benefits to juice, the high sugar content also contributes to the risks of obesity and dental disease. The Academy recommends giving infants only breast milk or formula until they are 6 months of age. Until now they have advised against offering fruit juice to children under 6 months, but have now expanded that time frame to include the entire first year of life. After 6 months, fruit can be added to the baby’s diet, but not in the form of juice. The new recommendations don’t stop at infants though: there are changes for older children as well. Children ages 1 to 4 need one cup of fruit per day, but only 4 ounces of that should come from fruit juice. That amount is only about half of a cup for the whole day. In addition, they recommend only 100% fruit juices. Many juices on the market today have added sugar, and other ingredients with no nutritional value. One important note for toddlers: DUMP THE SIPPY CUPS. Children love juice, and will often sip on a cup of juice throughout the day if given the chance. This exposes their gums and teeth to small amounts of sugar all day long, which can lead to cavities. (Sorry guys: this includes juice boxes too). Instead, serve them juice in a small glass or open-top cup at meal or snack time, and never at bedtime. Prolonged exposure of the teeth to the sugars in juice is a major contributing factor to dental caries. Children in this age group should still only consume 4 to 6 ounces of juice in a day. They recommend that parents focus on serving whole fruit, instead of fruit juice. Too much juice can contribute to energy imbalances, failure to thrive, and obesity in children. As opposed to fruit juice, whole fruit also contains important dietary fiber, a key component to a healthy diet. Choose fruits with lots of fiber, such as berries, apples, oranges, and pears. Older kids need 2 to 2 1/2 cups of fruit each day, and up to a cup of that can come from 100% fruit juice. And both parents and their children should learn to read labels carefully, to avoid sugary “juice drinks”, “juice beverages”, etc. Many of these juice cocktails may boast added vitamins, but usually have added sugar and other ingredients as well. 100% fruit juices should be the only juice consumed by children, and they should always be pasteurized to reduce the risk of illness. Pediatricians also recommend avoiding fruit chews and gummy snacks. Dentists know the danger these snacks pose to a child’s teeth. The sugary fruit-flavored candy sticks to the teeth, often lingering for hours, and significantly raising the risk of developing cavities. If your child resists whole fruit in their diet, canned fruit in its own juice is better than sticky fruit snacks. Juice should not be introduced into the diet of infants before 12 months of age unless clinically indicated. The intake of juice should be limited to, at most, 4 ounces/day in toddlers 1 through 3 years of age, and 4 to 6 ounces/day for children 4 through 6 years of age. For children 7 to 18 years of age, juice intake should be limited to 8 ounces or 1 cup of the recommended 2 to 2.5 cups of fruit servings per day. 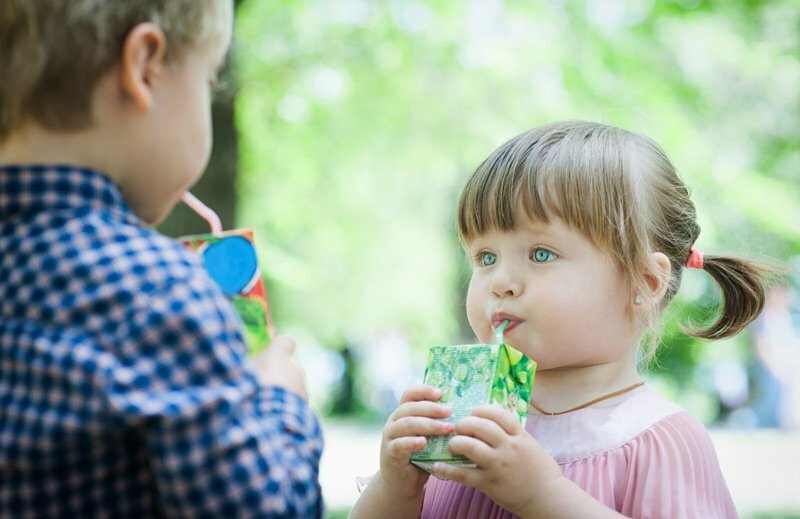 Toddlers should not be given juice from bottles or easily transportable covered cups that allow them to consume juice easily throughout the day. Toddlers should not be given juice at bedtime. Children should be encouraged to eat whole fruit to meet their recommended daily fruit intake and should be educated regarding the benefit of fiber intake and the longer time to consume the same kilocalories when consuming whole fruit compared with fruit juice. Families should be educated that, to satisfy fluid requirements, human milk and/or infant formula is sufficient for infants and low-fat/nonfat milk and water are sufficient for older children. Consumption of unpasteurized juice products should be strongly discouraged in infants, children, and adolescents. In the evaluation of the risk of dental caries, pediatricians should routinely discuss the relationship between fruit juice and dental decay and determine the amount and means of juice consumption. A small amount of 100% fruit juice is okay for your child, just make sure and monitor how much they drink, and how they drink it. These habits can affect their health for years to come! *Read more on this Policy Statement from the American Academy of Pediatricians here.